12:56pm: Judge Alsup wraps up today's first ever court-mandated climate crash course by showing off his very cool space tie. Judge Alsup has tie (painted?) with what looks like a Hubble snapshot of deep space - yellow galaxies on blue. He's ready to science! 12:553pm: Judge Alsup tells attorneys for the other defendants that they have two weeks to sign on to Chevron's presentation. 12:45pm: Judge Alsup poses an interesting question about wildfires: Don't they emit a lot of carbon dioxide into the air? Is that a tiny factor in the overall rise of CO2 emissions? KQED's Molly Peterson observes that the judge may be trying to compare wildfire CO2 emissions to fossil fuels. Wuebbles tells the judge that while he has not done the math on fire emissions, it is small compared to fossil fuels. Up to 3 percent of annual U.S. greenhouse gas emissions come from wildfires, according to the American Forest Foundation. The Los Angeles Daily News reported last year that in less than one week, wildfires in Southern California released harmful emissions equal to that of every car, truck and big rig on the state’s roads in a year. 12:19pm: Climate science has advanced in the years since 2012, notes Nobel-prize winning climate researcher Wuebbles. He is responding to Chevron's tactic of limiting their tutorial to certain years, a move that some say serves to downplay the impact of climate change. 12:18pm: To wrap up the climate tutorial, city plaintiffs have called Donald Wuebbles, lead author of the U.S. National Climate Assessment, to speak about the best available science on climate change. 12:16pm: And that's a wrap for Chevron. 12:11pm: An interesting strategy being employed by the defense is to limit reports on sea level rise to certain years, a tactic which some say is misleading. 11:55am: The attorney for Chevron just informed Judge Alsup that he is presenting on behalf of his client alone. 11:48am: Along with attempting to poke holes at the certainty of climate science, the defense is also arguing that the extraction of fossil fuels is not the problem, rather its the use of their product. That would seem to relate back to their earlier "collective responsibility" argument. 11:27am: Judge Alsup is apparently a fan of physicist Svante Arrhenius, who in 1896, made the first estimate of climate sensitivity, calculating that surface temperatures would rise by 4-6°C if carbon dioxide emissions doubled. 11:21am: The strategy apparently being employed by Chevron lawyers is to argue that climate science is filled with uncertainty. At the #climatetutorial, it appears that Chevron's strategy is to portray climate science as a field that is characterised by significant uncertainty and conflicting scientific theories. 11:10am: KQED'S Molly Peterson reports that during the summary portion of early 20th century climate science, Judge Alsup interrupted the Chevron attorney to point out that he skipped meterologist Guy Callendar’s landmark 1938 report linking fossil fuels to global warming. You can read more about Callendar's findings at The Guardian. 10:58am: Remarks on the defense's presentation. 10:35am: The attorney for Chevron is largely relying on data from the Intergovernmental Panel on Climate Change. Reporters at the hearing note that no experts are presenting on behalf of the oil companies. No indication so far that oil companies will be calling scientists to talk to Judge Alsup today. Chevron attorney is doing the talking. Avi Garbow, former general counsel at the Environmental Protection Agency under the Obama administration, tells KQED that Chevron supports the scientific consensus that burning fossil fuels is the leading cause of global warming. "That’s the established scientific consensus and from Chevron’s standpoint, there’s now no reasonable scientific debate about that conclusion," said Garbow. "Chevron accepts that and that’s what it will present to the court in the tutorial." Instead, oil industry lawyers will argue that the courtroom is not the proper forum for tackling climate change issues. This isn’t the stuff of science fiction. It is happening already, right here in the United States. It just gets worse—a lot worse—the more carbon we send up into the atmosphere. Just as America suffers, so will the rest of the world. And some of their suffering will spill back onto us. We already have plenty of examples of how climate impacts in other countries threaten global stability and our national security. These include the historic drought in Syria that drove over a million people, mostly young men, to move to cities in search of work and which, in turn, contributed to civil unrest and unprecedented mass migration. 9:21am: Myles Allen is done with his presentation. The next witness for plaintiffs is Gary Griggs, professor of Earth Sciences at the University of California Santa Cruz. Grigg will focus on how sea level rise is affecting San Franciso. Prof Griggs: Showing chart of sea level rise, steep rate of increase 20,000 years ago and then even steeper rate of increase today. Discussion of lower sea levels thousands of years ago, including ancient peoples crossing the land bridge to North America. 9:05am: Today's tutorial, a key early step in the case, is divided into two parts. The first part is 60 minutes and will have both sides presenting the history of climate change study. The second portion will have both sides present the best available science on climate science, including data on coastal flooding and sea level rise. 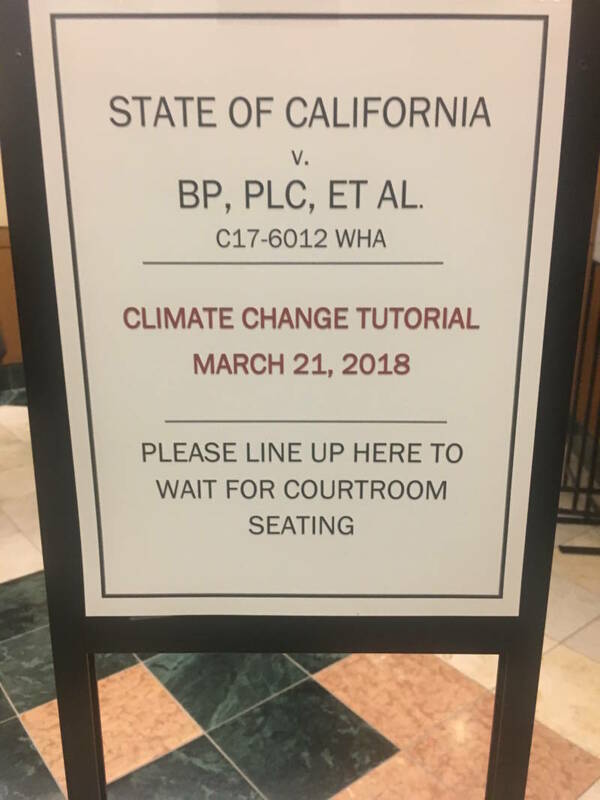 8:42am: Jessica Wentz, a lawyer at Columbia University's Sabin Center for Climate Change Law, is live tweeting from Judge Alsup's courtroom in San Francisco. A report issued by the Sabin Center in February titled "U.S. Climate Change Litigation in the Age of Trump," finds that lawsuits calling for climate protections exceeded those that opposed climate deregulation by roughly 3:1 (73% to 27%). 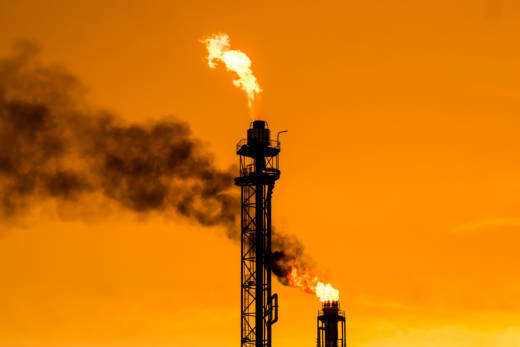 Such cases mark a surge in "municipalities suing fossil fuel companies under state common law and a suite of Freedom of Information Act (FOIA) lawsuits seeking transparency from the Trump Administration." 8:36am: KQED's Craig Miller writes that oil industry lawyers will not try to debate climate science during today's hearing. Their strategy instead will be to have the case thrown out. They've filed a motion to have the case dismissed, arguing that the courtroom is not the appropriate place to set climate policy. 8:29am: First mention of Sventus Arrenhius, who wrote what’s widely considered to be the first paper on climate change. KQED's Molly Peterson reports that Judge Alsup is establishing himself as an active questioner in the climate tutorial, interrupting Allen and asking for clarification on powerpoint graphs. 8:19am: The first expert presenting to Judge Alsup is the Environmental Institute's Myles Allen, who is arguing for liability for oil companies. 8:15am: A federal judge in San Francisco is getting a five-hour crash course on climate science today. Judge William Alsup is presiding over a lawsuit filed by Oakland and San Francisco against several oil companies for the costs of climate change impacts. Alsup has taken the unusual step of asking both sides to present their views on the state of climate science. Follow our blog for special live coverage. KQED's Molly Peterson is also tweeting live from the courtroom at @mollydacious.